Say What? How Big is Student Debt Load? 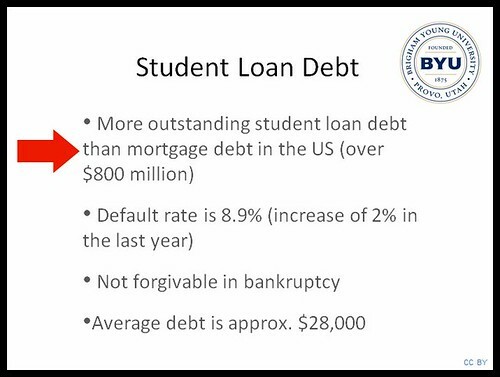 In a recent Educause Live webinar (10/10/11), Dr. David Wiley was speaking about “Openness: Decoupling the Future to Radically Improve Access to Education.” In that broadcast he used the slide below while stating that student loan debt exceeds mortgage debt. With all due respect to the learned Dr. Wiley, a man that I respect very much – ummh, sorry, but that’s not even close to being true. My guess is that this one piece of erroneous information (in an otherwise great presentation) was just a simple mistake. About a year ago it was widely reported that student loan debt ($829B in Aug 2010) in the U.S. topped credit card debt ($826B) for the first time ever. For a current figure, let’s consult the Student Loan Debt Clock. So, currently, student loan debt is approaching 950 billion dollars. However, mortgage debt is much, MUCH, larger than the student debt loads. I’m finding conflicting data about the size of mortgage debt, but you’ll see numbers between $10 trillion and $14.6 trillion. That’s trillion, WITH A “T” – big difference between that and 948 billion. Just sayin.